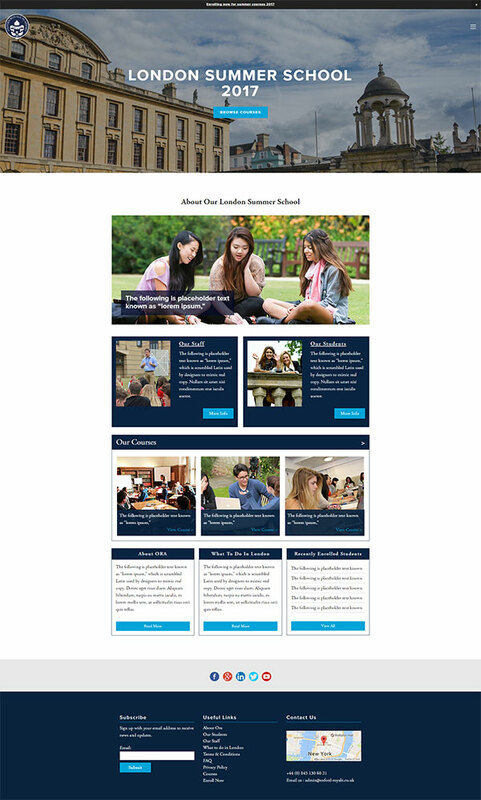 Oxford Royale Academy is award-winning Oxford Summer School on the campus of the University of Oxford. They are passionate about providing the highest possible quality of teaching that engages and challenges our students to push themselves academically. Their teachers are encouraged to use the latest techniques in interactive learning to ensure that their students actively contribute to class discussion. They providing exceptional academic and cultural experiences for students aged 13 to 25. They provides students from all over the world with the chance to live, study and dine in colleges of the University of Oxford. Throughout the duration of their course, students will have the opportunity to be taught by ORA’s experienced and passionate faculty, and will enjoy learning in the environment of one of the best universities in the world – Oxford. Our experienced developers fixed all the bugs that were present in both the mobile and desktop versions of the existing WordPress website. Our WordPress developer use Google Analytics which sets a cookie for the purpose of anonymously identifying when users return to specific websites. Generally provide a more convenient browsing experience. We have rectified the existing issues in the site and developed the new section. Also, we added a feature that allows the registered users to like the images and post comments. We successfully delivered the wordpress website enhancement project on-time and got the 5-star rating from the client. Don’t hesitate to reach out! Consultation is free. Contact us today! Subscribe to our Newsletter to receive Offers & Technical tips. © 2019 Simple Intelligent Systems.